Forza Horizon 3 is many things. At night, it’s the greatest Need for Speed game since 2010. Head into a skill challenge and it has more kudos than 2007’s Project Gotham Racing 4. Slide off the hot asphalt and onto the dust and you’ll find the all-disciplines-welcome approach of Codemaster’s Dirt 3. 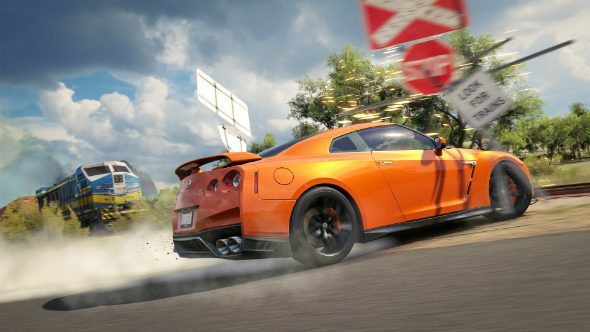 If that’s not enough for you, there are also hints of Sony’s arcade/sim blend, Driveclub, and it packs an open-world adrenaline punch that few racers have stirred up since Burnout Paradise. But despite this litany of comparisons, Playground Games never lose sight of what lies at the heart of a Horizon game: the joyous mix of cruising along the open road one minute and partaking in an absurd race against speedboats the next. To see how the game runs on PC, check out our Forza Horizon 3 PC port review. What’s perhaps more surprising is just how well refined the experience is this time around. Not that Playground deserved to be doubted, having delivered two absolute corkers in the series so far, but this time Forza’s spin-off experience has been tweaked and tinkered with to near-perfection. How so? Part of the answer seems to be ‘go down under’. A sizeable chunk of eastern Australia plays host to the Horizon festival this time around, and it’s the star of the show. Not only does the setting look absolutely sublime on PC, but it’s varied in a way Horizon 2’s Mediterranean never was. The dense damp of the rainforest in the west is rivalled only by the sparseness of the dusty outback in the north. Go east and you’ll hit Surfer’s Paradise, a gleaming stretch of skyscrapers and city bustle, with the lush sands of Byron Bay to the south. It’s much larger than any Horizon game previously, too, which means greater freedom for impromptu road trips to test out your latest toy. But it’s also the little things that add up. The detail is meticulous – both visually and in terms of sound design – in a way that only the Forza series can boast so confidently – the metallic gleam of a McLaren P1, the throaty roar of a classic Shelby, the way the brake discs on my fully customised Ferrari 458 glow orange-hot under heavy strain. Horizon 3’s biggest new graphical update is its global illumination lighting, and the results are marked. Weather effects have an even greater sense of realism, but it’s the sky that sells things most effectively – from sunrise to sunset and into the night, the skyboxes are so varied and colourful that they’re almost better suited to a sci-fi game than a racer. It’s wonderfully rich, and conveys the exotic thrills much better than its predecessor’s comparatively placid weekend-away to Europe. 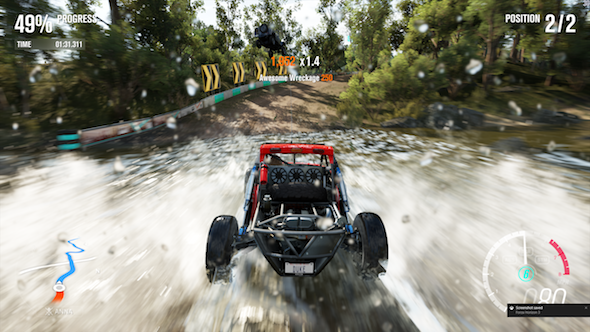 The game makes full use of its varied geography, with a supremely bold introduction throwing you straight into the driving seat of a Lamborghini Centenario, pelting across a hillside with a picturesque mountain in the distance, before seamlessly shifting you into a pack of hefty 4x4s as they race along Byron’s sun-soaked dunes. Then, before you know it, you’re going head-to-head with a jeep through the damp of the rainforest. But it’s not any old race: the jeep is dangling from the bottom of a helicopter and you’re trying your best to keep up. Not all of Forza Horizon 3 is that outrageous – its most inventive scenarios are reserved for five showcase events that unlock throughout the course of your career – but it is continually fun across all of its standard race types. There’s a far greater focus on off-road, but the game gives you exciting mixes of the two, with races that transition between the warm asphalt and sloppy mud, and there’s nothing quite like taking a Koenigsegg Regera and ramming it through the undergrowth with barely any grip to speak of. You earn points for practically everything you do. Win races and you’ll earn money to buy more cars. Complete PR stunts like huge jumps, scripted bucketlist events or skill tests and you’ll accrue new fans that go toward expanding the festival. Do anything else – race, destroy scenery or smash into traffic – and you’ll earn points that go into your overall level. 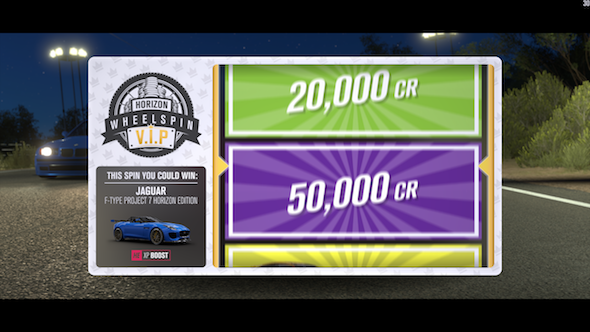 Every time you rank up, you’ll get a spin of Horizon’s now-standard lucky dip, which hands out free cash and cars. You’re always working toward something, and it’s a wonderful gameplay loop. The biggest structural change is that you’re now the boss of the festival, which means taking control of the events that get set up across the map. This takes the breadth of previous Horizon games and ramps it up to an even greater degree, but never pulls you away from what you enjoy doing. Simply drive up to a newly discovered event and you’ll get a list of different types of race, from multi-stage championships to a straight head-to-head. A few hours into the game you’ll also unlock the ability to create your own events with Horizon 3’s new Blueprints. This is all transposed into co-op, which runs concurrently with the main game, meaning you can progress through your career either on your own or racing against friends. Even when driving around solo, though, you’ll see dozens of different drivatars co-existing in your world. Pull up behind one and you’re able to challenge them to a quickfire head-to-head; win against particular drivatars that come up throughout your career you’ll recruit them to your roster. It’s a neat system, and you can hire and fire depending on how each driver is performing. Unfortunately the head-to-heads themselves aren’t nearly as interesting as they should be. They’re just too easy, simply because you can go offroad and shortcut your way to the finish while your AI opponent sticks to the roads. There’s tons to do, but I quickly slotted into a comforting rhythm of completing a handful of different events, occasionally stopping to buy a car I fancied look of, or to set up a blueprint event to post online, before heading off to my next festival expansion, showcase or bucketlist. 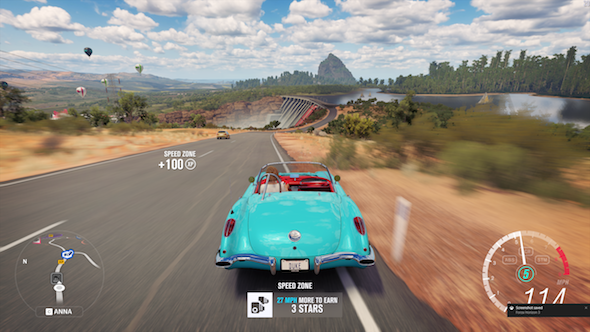 There’s a particular satisfaction in just driving from place to place, getting distracted on the open road, and it’s clear why Horizon 3 charges you in-game money to fast travel – there’s just too much to see to be letting you teleport for free. I spent about an hour just cruising around in my baby blue 1957 Chevy Corvette and it was some of the most fun I’ve had in a racing game this year. In terms of the actual on-track action, it took me a couple of hours to find the perfect difficulty balance, but the game smartly let me know when it thought I was having a little too easy a time with the AI, and suggested I bumped it up to a greater difficulty. 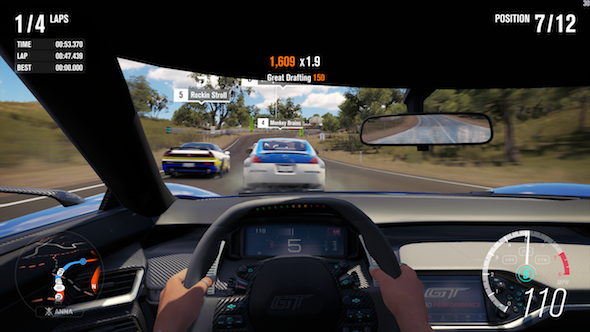 I expect a lot of racing purists will frown at the relative lack of challenge that Horizon 3 gives to its players – there’s always the option of a quick rewind to correct any errors – but I personally prefer being able to tailor the experience. It’s a breath of fresh air after daunting, specialised racers like Dirt Rally, and it fits the carefree vibe that Horizon revels in. 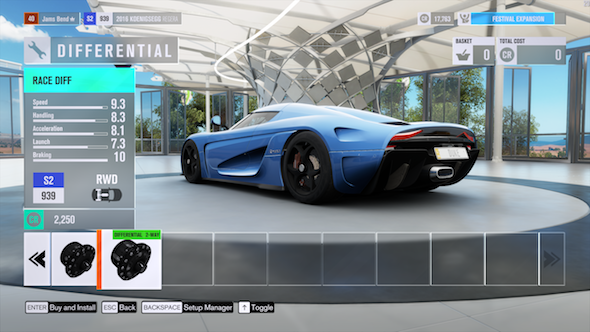 If there’s one part of Horizon 3 I categorically dislike, it’s the menus. They’re so slow to navigate and load, and considering you’ll spend quite a bit of time choosing new cars, customising them, setting up events and navigating through the festival, it becomes a chore. That becomes a real annoyance especially when you have to go back to the festival if you want to change cars. But with such a vast amount to do and with so much depth within those frameworks, Forza Horizon 3 is a triumph. It’s a racing game for everybody: not ridiculous enough to be mistaken for the next Blur or latest Burnout, and not a by-the-numbers track experience like its bigger, older Motorsport brother. The result is a pitch-perfect balance of arcade spectacle and sim authenticity, and it runs rings around its open world contemporaries. Catch Forza Horizon 3 at its best – a sunset race just after some heavy rainfall when the roads are still slick, a groovy Flight Facilities track blasting out of the radio – and it’s the best racing game of this generation.